Another hot steaming plate of comfort food during the rains! 🙂 Jeera rice is nothing but steamed Basmati white rice seasoned with Cumin. 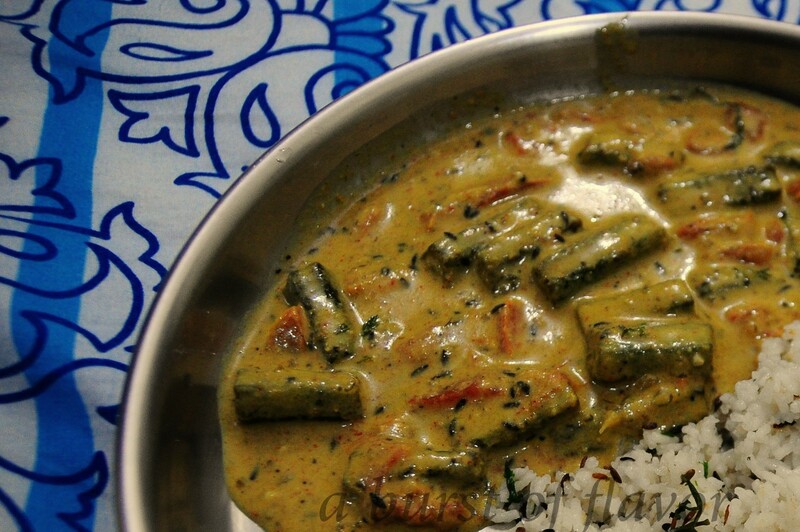 Dahi Bhindi Masala translated means Okra in spiced Yoghurt sauce. 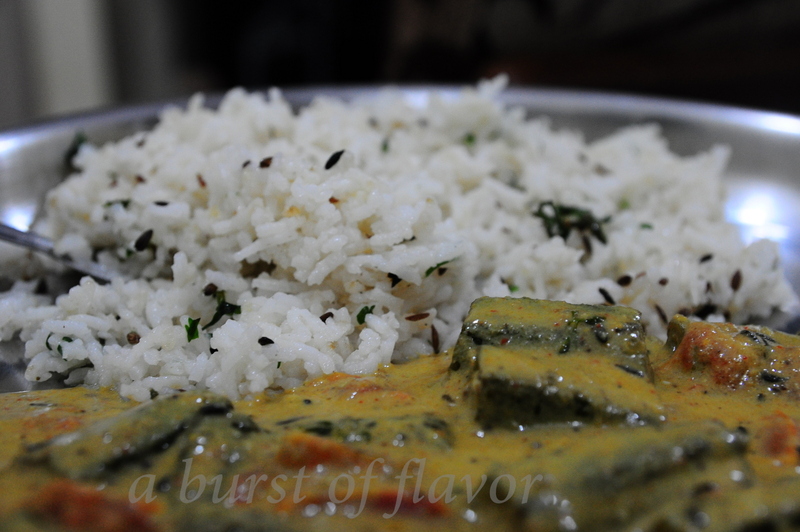 Jeera rice is a breeze to make, and the Dahi Bhindi Masala (although involves some effort) compliments the rice deliciously well. Read on for the recipe! 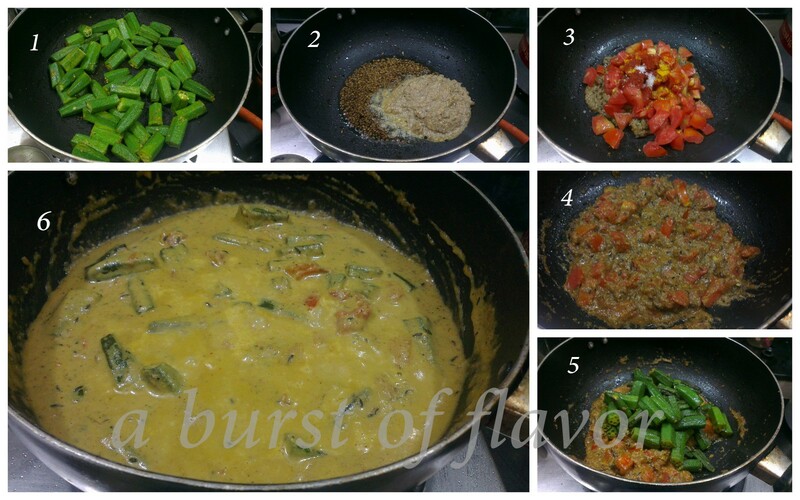 Sauté the Bhindi (Okra) in the hot oil for few mins on medium flame , adding salt and turmeric. (I feel adding turmeric makes the green of the Okra brighter, and salt is known to reduce the sliminess of the Okra). Remove the Okra once done and transfer into a plate. Use same pan/kadai so you can utilise the leftover oil from the frying. If required, add more oil. Once hot, add cumin seeds and let it splutter. Add onion paste and fry until raw smell is gone. Add garam masala powder at this point and sauté until the mixture oozes oil from the sides. Add tomato, red chilli powder, turmeric, salt and sugar. Mix well and let it cook for 2 minutes. Add the sautéed Okra and mix well. (Now, I missed to take a photograph of adding the yoghurt, cashew paste and milk to the gravy because I was too worried about the mixture curdling or worse, getting burnt 😦 Cooking and photographing simultaneously is no mean feat ! ) So just add the cashew paste, beaten yoghurt to this mixture. Adjust for salt and sugar if required. Garnish with coriander and some ghee. Cook Basmati rice according to the instructions on the packet. Remove from stove & Let it stand for 5 mins. Fluff up the cooked rice with a fork gently, do not break the rice or mush it. Spread on a plate and let it cool for 10 mins. In a pan, heat oil and ghee. Add cumin and chopped green chillies and let it splutter. Add this to the plate of rice. Add salt, chopped coriander and mix with fork gently. Some add cream along with yoghurt and cashew paste, but I find that this an unnecessary addition of calories. Milk is good enough , but please add cream if you are making this dish for an occasion or want a richer gravy. You can substitute tomato puree for the chopped tomatoes. You can add ginger garlic paste while sautéing the onion paste in oil. This will impart more punch and flavour to your gravy. I completely ran out of stock, hence did not add. I certainly would have added them otherwise. Even if you choose not to use them, the gravy would still be yummy. You could add chopped onions to the oil while sautéing the jeera. This will add to the taste of jeera rice.